Intellexer™ is a linguistic platform for application development. 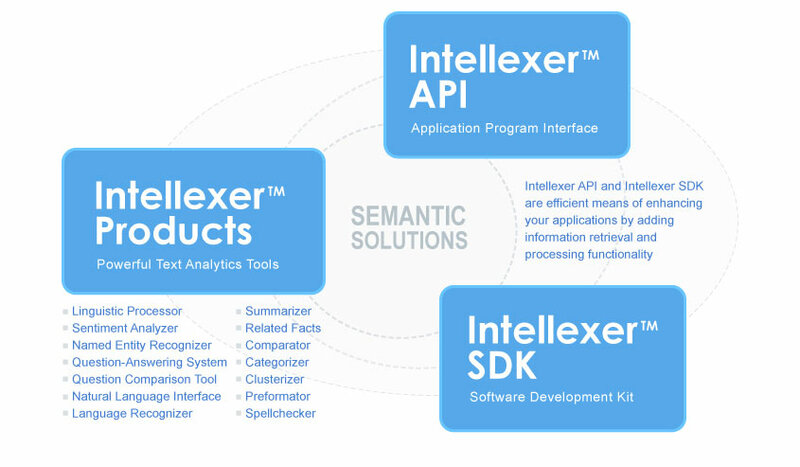 The unique architecture of Intellexer™ allows custom development of semantic solutions based on the Intellexer™ API (Application Program Interface) or Intellexer™ SDK (Software Development Kit). Also, it facilitates the delivery of off-the-shelf intelligent software. Intellexer™ API and SDK provide core functionality for a semantic system which can be easily integrated into your software and used by your company as a tool for the development of specific solutions. Intellexer™ products are cost-effective, complete products intended for language processing. Their high flexibility makes it possible for you to successfully implement complex projects that require the application of semantic technologies. For more information see Products. We are ready to assist you in selection of the most appropriate way to meet your company’s needs. We can help you to determine whether you need to implement new solutions or reengineer your existing resources. Our experts are ready to provide consultation to you on any issues related to use of our solutions.